Classic Plastics has been fabricating plastic body bags for more than 15 years, using quality raw materials and construction methods to exceed all standards. 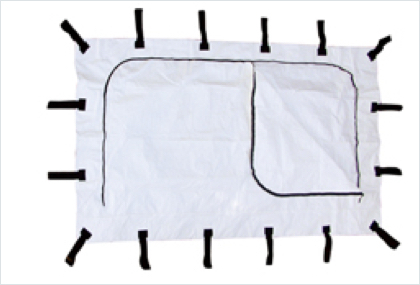 All of our body bags are sewn and seal reinforced with a .375" wide heat seal bar. We have experience in construction using olefins, polypropylene, reinforced poly material, PVC, nylon, mesh PVC and bioplastics such as PLA and PHA for mortuary bags. Our body bags come in multiple colors; white is pretty popular because you can write on those bags. Our black body bags are leak resistant and we also have orange body bags. Classic Plastics body bags are trusted by countless businesses and industries. Our body bags have been used by everyone from the U.S. Army to coroners and even hunters. Our heavy duty and jumbo body bags can work well for hunting season. The carry handles make it easier to haul the carcass. The lined bag helps to keep your vehicle clean while transporting the remains. Our mortuary bags have also been seen on popular TV shows such as the Holywood set of Law and Order and the new TV show Designated Survivor. Other applications of our mortuary bags are listed below. Classic Torso is a 31"x49" vinyl bag, featuring an envelope-style zipper construction and three identity tags. Our most popular bag, the Classic Standard measures 36"x 90" and is our most economical bag in service. The Classic Medium features the same construction as the Classic Standard, but with double the thickness of the Standard. Constructed with heavy .020 gauge vinyl, our Classic Heavy is our premium bag, featuring a leak-resistant interior film layer, and dual envelope style zipper. Classic PE-SCRIM is made from a durable polyethylene with a reinforced nylon scrim material that complies with EPA burn restrictions. Our 6 Handle PE-SCRIM comes with an envelope-style zipper and is available in white with black zipper and 6 supported, black carry handles.